After being moved from the Ministry of Social Protection in a cabinet reshuffle in January, the Minister Simona Broomes may once again find herself being shuffled should a conflict of interest arise with her at the Ministry of Natural Resources. Broome’s the Junior Natural Resources Minister is currently the subject of public scrutiny after transferring mining assets to her children. Despite her assurances persons are questioning whether the Minister would perform her functions in an unbiased manner where her children are concerned. 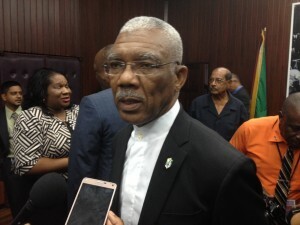 Questioned on the issue on Thursday’s taping of Public Interest, President David Granger expressed his willingness to once again transfer the Minister if a conflict of interest situation arises. “We have a draft code of conduct and if any situation were to arise, I am very confident she [Broomes] would be put in another place or she would demit office but that situation hasn’t arisen at the present time,” the President stated emphatically. Mr Granger said that despite the concerns raised and a call for her to be removed from office, he does not see the need to do that. 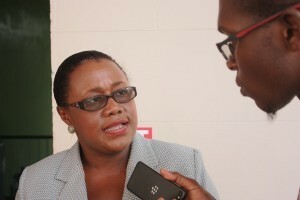 Broomes at a onday morning press conference on Monday, made it clear that the process to transfer the assets to her children was devoid of corruption as she detailed having written the Guyana Geology and Mines Commission (GGMC) to initiate the process and later having her children complete the process. “I am not responding to individual persons attack I am just giving clarity to the Guyanese people…I think that what is circulating out there at this time it is deliberate attempt to besmirch me,” said Broomes as she maintained “I have done nothing wrong.”.